Often referred to by its full title, Washington State, to distinguish it from national capital Washington, D.C. on the other side of the USA, Washington offers rugged coastline, deserts, forests, mountains, volcanoes, and hundreds of coastal islands to explore. The Cascade Mountains bisect the state, with the damp forested coastal areas to the west, and pine forests, deserts and irrigated farmland of the Columbia River Plateau to the east. On the southeastern side of the Cascades; this region features canyons, deserts and steppes set in hillside valleys. Cities included within this region are Kennewick, Walla Walla, and Yakima. Beautiful mountains and fresh water lakes, outdoor activities galore, national parks (North Cascades National Park) and secluded getaways await travelers to the North Cascades region. Cities included within this region are Bellingham, Leavenworth, and Wenatchee. Known for its rugged beauty with rain forests against a spine of dramatic mountains and miles of isolated beaches this area includes Olympic National Park. This semi-arid area includes the Lake Roosevelt National Recreation Area created by the Grand Coulee Dam. A scattering of forested islands in the serene waters adjacent to British Columbia. Ferries, private boats, kayaks, and orca (whales) criss-cross the waters, while float planes and bald eagles soar overhead. Known for its breathtaking coastline and amazing views along the Columbia River. There are many cities in Washington; these are some of the more popular. 47.6-122.1666672 Bellevue — Seattle's suburban cousin across Lake Washington, a commercial center with a growing downtown area. 48.750178-122.4749753 Bellingham — Home of Western Washington University. Near the Canadian border and Vancouver, B.C. 47.609722-122.3330564 Seattle — Largest city in the Pacific Northwest. Home of the University of Washington and Seattle University. 47.658889-117.4255 Spokane — The heart of Eastern Washington, unofficial capital of the Inland Empire and home of Gonzaga University and Whitworth University. 47.241389-122.4594446 Tacoma — Port city with several good museums downtown. Home for the University of Puget Sound, Pacific Lutheran, University Washington Tacoma (downtown), and Joint Base Lewis-McChord, a major army and air force base. 45.633333-122.67 Vancouver — Just across the Columbia River from Portland, Oregon. Not to be confused with the larger Canadian city of Vancouver, BC. 46.065-118.3302788 Walla Walla — Small eastern city in the heart of Washington's blooming wine country. 46.6-120.59 Yakima — In the Yakima Valley, the major agricultural and wine region of the state. 48.2183-122.6841 Ebey's Landing National Historical Reserve – preserves and protects an unbroken historical record of Puget Sound exploration and settlement from the 19th century to the present. Historic farms, still under cultivation in the prairies of Whidbey Island, reveal land use patterns unchanged since settlers claimed the land in the 1850s. 46.0036-108.0092 Lewis and Clark National Historic Trail – Between May 1804 and September 1806, 32 men, one woman, and a baby traveled from the plains of the Midwest to the shores of the Pacific Ocean. They called themselves the Corps of Discovery. 46.85-121.753 Mount Rainier National Park – a 14,410 feet volcano. Contains more snow and ice than all other Cascade range volcanos combined, and is the most "prominent" mountain in the lower 48 states. 47.96935-123.498566 Olympic National Park — Temperate rain forest, rugged Olympic Mountains and wild coastline, this is the only UNESCO World Heritage site in the Pacific Northwest. 48.532066-123.0292517 San Juan Islands — in the rain shadow of the Olympic Mountains in Puget Sound these islands are famous for abundant eagles and Orca whales and includes the newly formed San Juan Islands National Monument as well as the San Juan Island National Historical Park. 47.594722-119.3652788 Sun Lakes-Dry Falls State Park – An overlook where you can see the remains of the end of the last ice age where a flow of up to 10 times of all the present-day rivers of the world merged into a huge waterfall. While not as deep as the Grand Canyon, you can get dizzyingly close to the edge. Washington Coast – scenic, wild and interspersed with quaint towns the coast includes 100 km of wilderness coastline, the longest undeveloped coast in the contiguous United States. 48.08238.831 The North Cascade Loop is a very scenic drive that loops around this area through pristine mountains, grand rivers, crystalline lakes and scenic islands. If you can't do the loop, at least go as far as Mazama (eastbound) or the visitor center near Newhalem (westbound) on State Hwy 20. The most spectacular parts of the drive are not where the highway is sandwiched between the two halves of the national park, but further east in the Okanogan National Forest. Washington Pass is the highest point at 5,477 ft (1,669 m). As the park has virtually no roads, non-hikers should stay on the main highway unless clearly marked signs are visible (such as the visitor center which is about a mile to the south). The skeletal remains of Kennewick Man, one of the oldest and most complete human remains ever found in North America, were discovered in Washington. Prior to the arrival of explorers from Europe, the region had many established tribes of Native Americans, notable for their well developed economy, complex trade agreements, elaborate and generous culture and ornate art forms and carving. Prominent among their industries along the coast were salmon fishing and, notably among the Makah, whale hunting. The first recorded European landing on the Washington coast was by Spanish Captain Don Bruno de Heceta in 1775. He claimed all the coastal lands up to Prince William Sound for Spain, which they maintained made the Pacific a "Spanish lake" and all its shores part of the Spanish Empire. Early European explorers unwittingly introduced smallpox which decimated the native culture. In 1778, British explorer Captain James Cook sighted Cape Flattery, at the entrance to the Strait of Juan de Fuca, but Cook did not realize the strait existed. It was not discovered until Charles William Barkley, captain of the Imperial Eagle, sighted it in 1787. The straits were further explored by Spanish explorers in 1790 and 1791, and British explorer George Vancouver in 1792. The British Camp in the San Juan Island National Historical Park is the only part of a US national park that commemorates a British military site and the only one that flies the British Union Flag. Britain and the United States agreed to what has since been described as "joint occupancy" of lands west of the Continental Divide to the Pacific Ocean as part of the Anglo-American Convention of 1818, which established the 49th Parallel as the international boundary west from Lake of the Woods to the Rocky Mountains. Resolution of the territorial and treaty issues, west to the Pacific, were deferred until a later time. Spain, in 1819, ceded its rights north of the 42nd Parallel to the United States, although these rights did not include possession. Negotiations with Great Britain over the next few decades failed to settle upon a compromise boundary and the Oregon boundary dispute was highly contested between Britain and the United States. Disputed joint-occupancy by Britain and the U.S. lasted for several decades. With American settlers pouring into Oregon Country, Hudson's Bay Company, which had discouraged settlement because it conflicted with the fur trade, reversed its position in an attempt to maintain British control of the Columbia District. The growing populace of Oregon Territory north of the Columbia River formally requested a new territory, which was granted by the U.S. government in 1853. The boundary of Washington Territory extended farther east than the present state's, including what is now the Idaho Panhandle and parts of western Montana, and picked up more land to the southeast that was left behind when Oregon was admitted as a state. The creation of the Idaho Territory in 1863 established its eastern border at 117 degrees west. Washington became the 42nd state in the United States on November 11, 1889. It was the final state in the contiguous U.S. that has a coastline. While Washington (and especially Seattle) is often portrayed as an extremely rainy place, the climate of Washington is actually very diverse. The part of the state east of the Cascades is quite dry and arid. In the Puget Sound area, it rains often but the volume is not as much as many other major cities, and in the summer several weeks in a row can have no rain. Being in a convergence zone the weather can change very quickly and is often times difficult to predict. The west coast of the Olympic peninsula is the rainiest part of the state and sustains lush rain forests. Washington observes all the federal holidays, except Columbus Day. However, some cities and towns that have a large population of federal workers or military personnel might observe Columbus Day anyway. The Pacific Northwest accent spoken in Washington State is considered very similar to the General American standard accent (native to the Midwest), popularized in the 20th century by radio, TV and movies. People in the area generally have little to no problem understanding different accents of the English language. The Pacific Northwest attracts tourists from around the world, and it is common to hear many foreign languages being spoken in public in major tourist areas. There are ethnically diverse neighborhoods in some of the larger cities where many languages are spoken, including Seattle's large International District where many Asian languages are spoken. Washington is the thirteenth most populated state for example, but by comparison has the fourth highest Asian population. Spanish is spoken by the majority in some smaller pockets in eastern Washington and Oregon. Seattle's 98118 zip code centered on the Columbia City neighborhood in South Seattle is considered the most ethnically diverse zip code in the country by the US Census bureau with 59 languages regularly being spoken. Chinook Jargon was a pidgin or trade language established among indigenous inhabitants of the region. After contact with Europeans, French, English, and Cree words entered the language, and "eventually Chinook became the lingua franca for as many as 250,000 people along the Pacific Slope from Alaska to Oregon." Chinook Jargon reached its height of usage in the 19th century though remained common in resource and wilderness areas, particularly but not exclusively by Native Americans and Canadian First Nations people, well into the 20th century. Chinook Jargon was still in use in Seattle until roughly the eve of World War II, making Seattle the last city where the language was widely used. Today its influence is felt mostly in place names and a handful of localized slang terms. Pronunciation of some of these terms is difficult and often separates the visitor from the local. Many of the area names from Native American culture and may be difficult for outsiders to pronounce including Alki, Seattle, Kitsap, Yakima, Duwamish and Lummi. While still other areas were named by early Spanish and English explorers. Seattle-Tacoma International Airport, (SEA IATA), called "SeaTac" by locals, is the biggest airport in the region, and the major hub for flights throughout the state and the Pacific Northwest. It connects Seattle to all regions of the world, especially with frequent transpacific routes. Competition is heavy on the busy San Francisco Bay Area and Southern California routes. Transfers are required from the Caribbean and Central and South America. Spokane International Airport, (GEG IATA). Flights go to Seattle, Portland (Oregon), Boise, Oakland (across the bay from San Francisco), Salt Lake City, San Jose, San Diego, Denver, Phoenix, Las Vegas, Los Angeles, Minneapolis, Dallas/Fort Worth and Honolulu. Also, seasonal flights to both Chicago airports, and a weekend only flight to Anchorage. All direct service to Canada has been suspended. Portland International Airport, (PDX IATA) is just one mile across the state line in Oregon. For Southwest Washington (i.e. anything south of Chehalis along I-5 exit 77) this is the nearest major airport. There are daily international non-stop flights from Tokyo, Amsterdam, Guadalajara and Frankfurt. Tri-Cities Airport (PSC IATA) is a commercial airport 2 miles northwest of the city of Pasco and is the third largest commercial air terminal in the State of Washington. Flights go to Seattle, San Francisco, Los Angeles, Las Vegas, Mesa (near Phoenix), Salt Lake City, Denver, and Minneapolis (seasonal). Bellingham International Airport (BLI IATA) is a regional airport about 90 miles north of Seattle and 60 miles south of Vancouver, Canada. Allegiant and Alaska Airlines have jet service to Las Vegas, Los Angeles, Oakland, Mesa (near Phoenix), San Diego, Honolulu and Palm Springs (seasonal). There are many shorter flights (mostly to Seattle and San Juan Islands) with turboprop aircraft. Amtrak Cascades: Going north towards Vancouver, BC via Edmonds, Everett, Stanwood, Mt Vernon and Bellingham and south to Portland via Tacoma, Olympia, Kelso and Vancouver, WA. The train runs between Seattle and Portland 4 times daily and twice daily between Seattle and Vancouver BC and Portland to Eugene. At other times when they provide a bus from Portland to Eugene and from Seattle to Vancouver. Coast Starlight runs the same route with the same stops (except Tukwila and Oregon City) as the Cascades between Seattle and Eugene. The train continues southward from Eugene to Chemult, Klamath Falls, etc., on its way to Los Angeles. Empire Builder (Seattle branch): Connects Seattle and Spokane through Edmonds, Everett, Leavenworth, Wenatchee, Ephrata. Joins with the other branch coming from Portland (or split going westbound) in Spokane to continue east towards Chicago. Interstate 5 and the Peace Arch crossing is the main land port-of-entry to Washington from Canada. However this is only one of five land crossing points between the Lower Mainland region of BC and the Northwest Cascades region of Washington. See the Get in — by car section of Northwest Cascades region article for details. Interstate 5 (and Interstate 205) provide access from the greater Portland area. Interstate 82/US 395 provides access from eastern Oregon to the tri-cities area of Eastern Washington. For a more scenic entry, try taking US Route 101 along the Washington and Oregon coast, but be aware for the many speed traps in the small cities. Interstate 90 is the main route in via Coeur D'Alene, but US 2 provides access to the northern parts of Idaho and Washington. BoltBus. Service from Portland, OR; Seattle; Bellingham, WA; and Vancouver, BC. Fares $1-20. Cantrail (Western Trailways of Canada), (bus stops) Seattle's King Street Station & Vancouver's Pacific Station. Additional stops at Sandmans Signature Hotel and Pacific Inn in Surrey. No additional stops in the U.S., toll-free: +1-877-940-5561. Operates direct buses between Seattle to Vancouver, BC $40 for one-way, $75 round trip; discounts for students, military, seniors & children ages 4-11..
Greyhound, toll-free: +1-800-231-2222. Direct service to Seattle from Portland and Vancouver BC. Additional service from Sacramento (via Portland) and from Salt Lake City (via Boise, Stanfield or Portland). Prices vary depending on your destination. Northwestern Trailways, toll-free: +1-800-366-3830. Boise to Spokane via Horseshoe Bend, Cascade, Donnelly, McCall, New Meadows, Riggins, Whitebird, Grangeville, Cottonwood, Craigmont, Lewiston, Moscow, Pullman and Colfax. $51 one way to Spokane, $97 round trip. Quick Shuttle, toll-free: +1-800-665-2122. Runs between Seattle and Vancouver, BC. Stops in Downtown Seattle (outside the Best Western at 200 Taylor Ave N) and SeaTac Airport (at the main terminal near south end of baggage claim, outside door 00, bays 11-16). Despite the multiple stops they have, northbound buses can only pick-up in the U.S. and drop off in Canada and vice versa for southbound buses. Fares from Vancouver to SeaTac, fares are $49 one-way, $87 round-trip..
With the exception of the Victoria Clipper the ferries crossing the San Juan de Fuca and the Puget Sound are capable of transporting vehicles. Alaska Marine Highway System, toll-free: +1-800-642-0066. A ferry service from Bellingham, Washington up the Inside Passage to Haines Alaska. Plan your travel early as this service tends to fill up fast. They no longer go to Seattle. MV Coho by Blackball Ferry, 101 E Railroad, Port Angeles WA 98362 and 430 Belleville Street, Victoria, BC V8V 1W9 @ Victoria's Inner Harbour (. ), ☎ +1 360 457-4491 (WA No), +1 250 386-2202 (BC No). Crosses the San Juan de Fuca between Port Angeles and Victoria BC. $63 for car and driver (0-18ft)+$5.25 per lineal ft over 18ft. $18 per adult passenger & $9 per child..
Tote Maritime, (office) 32001 32nd Ave, Suite #200, Federal Way WA 98001 (. ), ☎ +1-800-426-0074. Operates more as a private shipping company than a "ferry" for shipping of vehicles and/or personal household goods between Anchorage AK and Tacoma WA for those moving between the lower 48 and Alaska. Washington State Ferries, ☎ +1 206 464-6400, toll-free: +1-800-843-3779. The Washington State Ferry system offers once or twice daily sailings from Sidney BC to the San Juan Islands with continuing service to Anacortes. For security and immigration processing when traveling between the US and Canada, a 60-minute advance arrival is strongly suggested for vehicle traffic. Walk-on passengers must arrive 30 minutes in advance. A quick and spectacular, though not cheap, way to travel. There are many American and Canadian companies offering sea plane travel into and around the Puget Sound area. Such as Kenmore Air and Northwest Seaplanes both based out of Seattle with regular scheduled flights and chartered flights within the region and into Canada. Many planes only offer between 6 to 8 seats and are small enough that the captain may ask for someone to sit in the front seat next to them. If you ask nicely they may be willing to take you on a scenic route or follow a pod of whales as opportunities and schedules allow. Cruise ships arrive in the area in both Astoria Oregon and Seattle Washington with continuing connections along the west coast including Canada and Alaska. Bell Street Pier Cruise Terminal at Pier 66, 2225 Alaskan Way S, Seattle, WA. near the middle of Seattle downtown's waterfront, serves as home port for Norwegian Cruise Line and Celebrity Cruises. Has bus, taxi and shuttle connections for transfer of passengers and luggage. For travelers with connecting flights, Seattle-Tacoma International Airport is less than 15 mi (24 km) away. Smith Cove Cruise Terminal at Pier 91, 2001 W Garfield St, Seattle. At the north end of Seattle's downtown waterfront, serves as home port to Holland America Line, Royal Caribbean and Princess Cruises. It is not coincidence that so many cities in this region are on the water. Early settlers found the thick regional forests too impenetrable to navigate by land so waterways became the Pacific Northwest's early highway system. However, when arriving from Canada or other foreign countries, there are only a handful of ports, including Roche Harbor, Friday Harbor, Anacortes and Bellingham, that are official U.S. ports-of-entry and can process boaters through customs. The Cardinal Rule is touch land at customs dock before any other stops; fines for not doing so can be up to $5000. Besides a passport for everyone on board, you will need your boat's license number and User Fee Decal number. Customs enforces USDA guidelines for what foods are acceptable to bring into the country and these guidelines are constantly changing so it is best to check in with them before arriving. Boaters are responsible for knowing the prohibited foods and can be fined for not declaring them. The Pacific Crest Trail (PCT) is a well known trail that extends along the West coast of the United States, from Mexico to Canada. It passes through California, Oregon, and Washington State. The Pacific Northwest National Scenic Trail is a trail connecting Washington with the Continental Divide Trail in Montana. To explore most of Washington (outside of main cities), you will generally need a car because there is very little public transportation, especially to more remote locations. Should you need to use your phone for navigation, use a speaker while hiding your phone or use a phone holder that you can hang onto your dashboard. Input your destination before you drive or have a passenger do it for you. It is not recommended to place it on your lap as you might still have the tendency to look down on it or as it may easily fall off. Should there be a need to answer or make phone calls, pull over to park or sync your phone with the car's entertainment system before driving so that you do not need to hold onto it. Washington's road network is well-maintained and cars are the quickest way to travel around the state. The main freeways are I-5, running along the west side of Washington through many of Western Washington's population centers. I-90, running east of Seattle to Ellensburg and Spokane, and I-82, which starts at I-90 near Ellensburg and heads southeast through Yakima and Kennewick. Other US highways and WA state routes access all parts of the state. Rental-car agencies can be found in the larger cities. All of the state's major east-west highways cross over the Cascade Mountains, which are subject to closure, delays, and studded tire or chain requirements in wintertime. In severe weather, it may be better to use I-84 just across the border in Oregon. This route goes through the relatively low elevation of the Columbia River Gorge. On rare occasion, I-84 may also have weather-related problems where it passes north of Mount Hood. A 20-mile detour on Washington State Hwy 14 is available between I-84 Exit #44 Bridge of the Gods, and Exit #64 Hood River Bridge. Both have a small toll. Washington State Ferries, ☎ +1 206 464-6400, toll-free: +1-800-843-3779. The Washington State Ferry system is the largest in the country. It has routes crossing Puget Sound and to Bainbridge, Vashon, Whidbey and the San Juan Islands from opposite sides of the Sound. In Eastern Washington they also operate the Keller Ferry to cross the Columbia River from Ferry County & the Colville Indian Reservation in the north to Lincoln County in the south. There are also numerous other destinations served by county operate ferries such as Anderson and Steilacoom by Pierce County Ferry and Anacortes to/from Guemes Island by Skagit County Ferry. Nearly all ferries accommodate vehicles for an extra charge. For the state ferry system, online reservations are recommended for vehicles, especially going to Seattle/Everett during the morning commute and the reverse in the evenings and during summers (especially weekends) between the San Juan Islands and Anacortes. Many ferry destinations are not islands without a bridge, but peninsulas where going by land would involve a very long detour. The most extreme example of this is the Port Townsend -- Keystone route on State Hwy 20 which is only five and a half miles across by ferry. Traveling by the shortest land route (Tacoma Narrows) turns into a whopping 217 miles (354 km) journey! Amtrak Cascades: Goes along the I-5 corridor, connecting Vancouver, BC; Bellingham, Mt Vernon, Stanwood, Everett, Edmonds, Seattle, Tacoma, Olympia/Lacey, Centralia/Chehalis, Kelso, Vancouver, WA and Portland, OR. Train runs between Seattle and Portland 4x daily and twice daily between Seattle and Vancouver BC and Portland and Eugene. At other times when they provide a bus from Portland to Eugene and from Seattle to Vancouver. Coast Starlight runs the same route with the same stops (except Tukwila and Oregon City) as the Cascades between Seattle and Eugene. Train continues southwards from Eugene to Chemult, Klamath Falls, etc. on its way to Los Angeles. Empire Builder (Seattle branch): Connects Seattle and Spokane through Edmonds, Everett, Leavenworth, Wenatchee, Ephrata. Empire Builder (Portland Branch): Connects Portland and Spokane through the Columbia gorge (Vancouver, WA, Bingen and Wishram) and Pasco. Both branches join (or split going westbound) in Spokane to continue east towards Chicago. The Puget Sound region is one of the most popular places for cruising on small craft in the United States offering hundreds of miles of protected coastlines and dozens of remote islands to explore. Many cities and towns were built around their harbors and are well suited to cater to visiting boaters. The Strait of San Juan De Fuca, the Pacific coast and even the Columbia River are also excellent areas to travel by boat with a wide variety of ports and possibilities for visiting boaters. BellAir Airporter, toll-free: +1-866-235-5247. Goes up from SeaTac & downtown Seattle to Stanwood, Burlington/Mt Vernon, Bellingham & Blaine on one route and a separate route to Anacortes and the San Juan ferry terminal in Anacortes from Burlington. They also have a third route and from Sea-Tac to Cle Elum, Ellensburg & Yakima. BoltBus, toll-free: +1-877-BOLTBUS (2658287). Service between Portland, Seattle, Bellingham and Vancouver, BC. Up to $30. Greyhound, toll-free: +1-800-231-2222. Greyhound travels primarily on Interstate 5 (Seattle-Vancouver & Seattle-Portland on two separate routes. Some southbound buses continue from Portland to Sacramento contiguously); 90 (Seattle-Spokane with some variation of the route diverging from Ellensburg to Yakima, Pasco (Tri-Cities), and Stanfield, OR along I-82; 84/US-395/90 (Portland, Hood River, The Dalles, Pasco & Spokane). Prices vary depending on your destination. Northwestern Trailways (Northwestern Stage Lines), toll-free: +1-800-366-3830. Seattle & Spokane via Everett, Stevens Pass, Leavenworth, Ephrata, Moses Lake and Wenatchee; Boise to Spokane via Horseshoe Bend, Cascade, Donnelly, McCall, New Meadows, Riggins, Whitebird, Grangeville, Cottonwood, Craigmont, Lewiston, Moscow, Pullman and Colfax. Fares vary by destination..
Apple Line (operated by Northwestern Trailways). follows a 160-mile route, along US-97, through Omak, Ellensburg and Wenatchee with connections to Amtrak and Northwestern Stage Lines in Wenatchee and Greyhound in Ellensburg. Dungeness Line (operated by Olympic Bus Lines). serves the Olympic Peninsula, connecting in Port Angeles, Port Townsend, Seattle and Sea-Tac International Airport with links to Greyhound, Amtrak and Washington State Ferries in Seattle and connections to the MV Coho Ferry to Victoria, B.C. in Port Angeles. Grape Line (Operated by Bellaire Charters). provides service between Walla Walla and Pasco. Connections to Greyhound, Amtrak and additional commercial flights in Pasco (Tri-Cities). Gold Line (Operated by Bellaire Charters). runs twice daily along US 395, connecting Colville, Arden, Addy, Chewelah, Loon Lake and Deer Park to Spokane and key transit hubs, including Spokane International Airport.. Various county-operated transit systems and private shuttle companies to/from SeaTac. There are various other county transit agencies across the state with some operating buses between cities & towns, across rural areas or suburban communities (Olympic Peninsula and Puget Sound Region). Services vary from every 15-30 min on multiple routes (Seattle Metropolitan area) to non-available (Cascade Mountains and much of central & eastern Washington) and everything in between. See the above link and the article of a specific locality as to what is available. The iconic snow packed Mount Rainier towers over western Washington and is symbolic of the natural beauty of the area which includes both the Olympic and Cascade mountain ranges which extend into Oregon and even down into northern California. 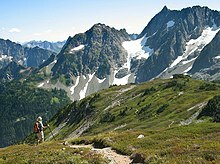 However Washington has several other national parks including the North Cascades National Park famous for having most of the glaciers in the lower 48 states and Olympic National Park which is the only UNESCO World Heritage Site in the Pacific Northwest and famous for its glacier peaked mountains, vast rainforests and the longest undeveloped beach in the lower 48. Mt. St. Helens was the site of one of the largest volcanic eruptions in recorded United States history and shed ashes over dozens of states. However Washington is also a very diverse region including rugged coastlines, sparkling streams, huge rivers, wide deserts and picturesque islands. The Columbia Gorge Scenic drive and its waterfalls follows along the mighty Columbia river which divides Washington from Oregon. A Discover Pass is required for all private vehicles entering a state park. There are some exceptions for camping, fishing, and hunting, which have their own fees, plus a few annual "State Parks free days." The pass applies only to vehicles--there's no per person admission charge to the parks. A daily pass is available for those staying only a day or two; otherwise it's valid for one year (no upgrades) for two vehicles. (Only one vehicle at a time, and you can fill in the second license plate number later.) Dealers, such as sporting goods stores, and online sales add a surcharge. As most state parks have no staffed entry booth, there's been confusion over whether it's allowed to enter without a pass, then purchase one at the ranger station or visitors center. Only do so during daily business hours, going promptly from the main entrance without any recreational stops in between. Calling the park ahead of time, and inquiring about the pass is a good idea if you don't already have one. Some smaller state parks, and even larger ones at off-peak times are completely unattended, requiring the pass be purchased elsewhere in advance. There's no additional fees for out-of-state vehicles entering the parks, but there is a non-resident surcharge for camping. Unlike many areas of the country, the prehistory of the region is rich and evident. Areas such as Suquamish still actively practice Native American traditions and Northwest Native American art is a common theme even in contemporary urban public artworks. The city of Seattle is named after Chief Seattle and many other natural and manufactured features bear the names of the areas first peoples which are often difficult for outsiders to pronounce. Most of the areas architecture can of course be seen in urban areas such as Seattle's Smith Tower which although now dwarfed by Seattle's modern skyscrapers stood for years as the tallest building west of the Mississippi. But interesting architecture can be seen even across rural areas such as Puget Sounds first lighthouse in Hansville. There are many museums in the region and although most of the well known one's such as the Seattle Art Museums and the Museum of Glass in Tacoma tend to be in the larger cities, many quality museums can be found scattered across the area and are often a rewarding and enriching break when exploring. Even small towns will sometimes offer their own regional art and historical museums that offer glimpses of local art, history and culture. Visit the San Juan Islands, famous for sailing, fishing, sea kayaking, scuba diving, hiking, bicycling and fine vistas and sunsets. Go bird-watching and see some of the 400+ species of birds with a local birding guide who knows all the best locations. The Pacific Northwest is best known for its salmon, but a large variety of other seafood is available in the area. Oftentimes seafood comes in short bursts with seasonal migrations available for only short amounts of time so watch closely for seasonal specials in restaurants and markets. Shellfish are the prized resources of the Puget Sound. The cool, clean waters provide some of the finest shellfish habitat in the world. Washington State is the nation's leading producer of farmed bivalve shellfish (clams, mussels and oysters) but other specialties like Geoducks are sometimes available for the more adventurous. The Dungeness Crab is a popular seafood prized for its sweet and tender flesh and high ratio of meat. Its common name comes from the port of Dungeness, Washington where the first commercial harvesting of the crab was done. The Dungeness Crab is a commercially important crab in the state of Washington's territorial waters and was the first shellfish harvested commercially in the area but other crab species are also common. The area's mild climate, rich soil and abundant water resources have created a bountiful climate for the many varieties of fresh produce available across the region. Farmers' markets are common in both urban and rural areas and a great way to experience local culture as well as local foods. Apples are one of Washington State's biggest exports with over 100 million boxes of apples picked every year and shipped around the globe but a wide variety of other crops are grown in abundance every year from wheat and potatoes to nuts and vegetables making fresh local produce abundant. Few, if any, American regions can challenge the Pacific Northwest's love of coffee. According to a group of industry market researchers, there were an amazing 1,640 coffee shops in the Puget Sound region in 2011, ranking it the most popular coffee region in the country but coffee is popular all across the region. It is not surprising that such coffee giants such as Starbucks have exported the Pacific Northwest's coffee culture around the globe. Microbreweries and beer in general are a Northwest specialty, and the area has many to offer for beer enthusiasts. In 2012 Washington had 158 craft breweries making it second only to California in the number of micro breweries. The larger brewers, like Redhook and Pyramid, distribute their products regionally or nationally like their coffee cousins, while other brews can only be found in local stores or bars (some notable brewers don't even bottle their product). Ask your servers for local beer recommendations and search out regional microbrews in stores. Hops are the key ingredient in beer making and Washington State's fertile Yakima Valley is by far the biggest exporter of hops in the US giving area brewers another edge in making the best beers. Eastern Washington is known for its wines. Walla Walla alone boasts over one hundred wineries – including some of the area and nation's best cellars – with tasting rooms downtown this area is popular for winery tours. But don't expect the stodginess of elitist wine areas elsewhere; eastern Washington has many affordable and welcoming communities with small town roots. Do not litter along the freeways or highways. The fines for littering can range from several hundred to several thousand dollars depending on the scenario. It is an offense that the state takes very seriously. If you are caught in the act you will know what the state means by the "Litter and It Will Hurt" signs which frequently decorate its roadways. Like many western states, Washington State has had cases of hantaviral pulmonary syndrome, 41 confirmed cases in the state since 1993. Realistically, however, hantavirus is of very little concern to the traveler; but sensible precautions should be applied. Do NOT venture in a wild animal's den or handle any dead animals; particularly rodents, as rodents seem to be the primary vector of the illness. There is no cure for the disease, treatment mainly consists of supportive therapies. The main defense against the virus is prevention. For more information on prevention and transmission, visit the Centers for Disease Control and Prevention website on hantaviruses. In the Cascade Mountains (which divide the state into halves) there can be significant snow accumulations during the late fall and winter months. This poses a danger for avalanches whenever these areas experience warm up periods, regardless of how brief they may be. Mountain passes are sometimes closed for avalanche control and may effect travel plans, especially along I-90 from Yakima to Seattle. Check the Washington State Department of Transportation website for information regarding Avalanche control. If going into the mountains during winter and early spring months, refer to the Northwest Weather and Avalanche Center website for information regarding the current avalanche dangers throughout the Cascade region of the state. Washington is generally very safe and the chance of you running into any trouble is very, very unlikely. Certain areas of Seattle, Tacoma, Spokane and Yakima can become seedy after dark and it is therefore advised that one avoid being out alone very late at night; this is especially true in unlit places where you are an easy target for any crime or other illegal activity. See the "Stay Safe" section of the Seattle, Spokane, Tacoma, and Yakima articles. Always be confident, or at least fake confidence. Obviously, pick pockets and such tend to target people who look vulnerable. Avoid wearing excessive amounts of jewelry and other expensive items which might catch a robber's eye. Be sure to secure personal belongings where they will not be tampered with or stolen. Property crime is the largest threat in the state to a tourist. If you find yourself in an emergency situation (of any kind), dial 9-1-1 on your phone or for free from any available payphone. The Columbia River flows through central Washington before defining Washington's southern border. East of the Cascade Mountains, the state's terrain begins to turn into desert and temperatures often exceed 100 °Fahrenheit in regions such as the Yakima Valley and the Columbia River Plateau. If are planning on hiking into these locations, follow desert survival guidelines. Be sure to take plenty of water (at least one gallon per person, per day), sunscreen and wear light clothing. Let someone know where you are going and when you expect to get return. Also, it is best to hike during the earlier part of the day, as thunderstorms tend to develop suddenly during the afternoon. In the event you encounter inclement weather conditions, seek high ground immediately. Thunderstorms can cause flash flooding in canyons and other low laying areas. Washington is one of a handful of states where recreational marijuana use is legal. Under state law, any adult aged 21 or over may possess up to 1 ounce (28 g) of usable marijuana (the harvested flowers or "bud"), 16 ounces (450 g) of marijuana-infused product in solid form, 72 fluid ounces (2.1 L) in liquid form, or any combination of these. You can buy marijuana only at retail stores licensed by the state to sell marijuana. Smoking in public and driving while high are still illegal. The DUI limit is 5 nanograms of THC per milliliter of blood. It's also illegal to take any marijuana into military bases in Washington state or out of Washington, including to Washington's marijuana-friendly neighbor, Oregon; this is considered drug trafficking. And it's still a federal crime to keep or smoke marijuana, despite what Washington's laws say, though enforcement is in a state of flux. If you choose to partake, inform yourself of the risks. There are a few scattered "clubs" in the state allowing patrons to smoke, and medical marijuana shops are prolific, but the state legislature is still working out the details and taxation. Hempfest, an annual summer rally in Seattle, is the largest pro-marijuana rally in the world. The drinking age in Washington is 21, and the DUI limit is 0.08% blood alcohol content. Earthquakes and tsunamis are unusual but not unheard of in Washington State including the possibility of a Subduction Zone or Megathrust Quakes which are the largest type of earthquakes in the world. Most coastal areas have well marked evacuation routes so always be aware of your surroundings. During the winter months, the western side of the state often receives significant rainfall which soften the grounds to such a point that landslides sometimes occur. Be especially alert when driving. Embankments along roadsides are particularly susceptible to landslides. Watch the road for collapsed pavement, mud, fallen rocks, and other indications of possible landslides or debris flows. If you encounter a landslide, leave the area immediately if it is safe to do so and call the local fire, police or public works department. You must be 18 years of age to legally smoke tobacco. It is illegal in Washington state to smoke in a workplace, restaurant, bar, bowling alley, non-tribal casino, and bus stop (though everyone does ithe latter). Smoking is also banned within 25 feet (8 meters) of a door or window that can open or a ventilation intake. Volcano safety is, to put it mildly, a controversial subject; see the article on Volcanoes (and, particularly, its discussion page) for some of the issues. Washington state is home to five major, active volcanoes, plus one just across the border in Oregon: Mount St. Helens (1980), Mount Rainier (1894), Mount Baker (1880), Mount Hood, Oregon (1866), Glacier Peak (c. 1700), and Mount Adams (c. 550 B.C.). The majority of these are considered to be tourist destinations, particularly Rainier and St. Helens. If planning to visit one of these locations, follow the policy regarding any road and/or trail closures that at first glance may appear unnecessarily conservative, but it is not. The closures aren't there simply to inconvenience and irritate you. If a trail is closed due to eruptive hazard then stay off the trail. Oregon - The state's southern neighbor is known for lush forests and craggy mountains. Idaho - Washington's eastern neighbor is a rugged state, with snow-capped mountains, whitewater rivers, forests, high desert, and plenty of wilderness. British Columbia - Crossing the state's northern border into Canada leads into the mountainous terrain of British Columbia and the seaside city of Vancouver. There's also a ferry from Port Angeles to Victoria on Vancouver Island. Montana - While Washington does not share a border with Montana, due to the narrow panhandle you can pass through Idaho in just over an hour on I-90, US 2, and Route 200. However, allow more time on US 12 in the southern part of the state, as Idaho is significantly wider here. Alaska - Though quite far, Washington State has been the gateway to Alaska for well over a century, with ferries and cruise ships connecting the two today. In addition, there are dozens of flights to Alaska's four main cities from Sea-Tac Airport, mostly on Alaska Airlines. This region travel guide to Washington is a usable article. It gives a good overview of the region, its sights, and how to get in, as well as links to the main destinations, whose articles are similarly well developed. An adventurous person could use this article, but please feel free to improve it by editing the page.